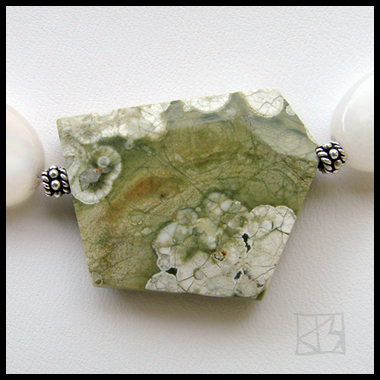 Rainforest rhyolite comes from the area around Mount Hay in Australia, an ancient extinct volcano. Another example of how misnomers go viral and pervade the internet, this fabulous stone is often sold as 'Rainforest jasper'. Molten rhyolite ride lava flows from deep within the earth, cooling so quickly as to form bubble-pockets in which other bits of minerals collect, most commonly silicas. Close inspection discloses tiny druse (drusy) crystal formations called vugs. It is said to assist in meditation, bringing focus and calm, boosting determination. The uncommon shape commands the eye's attention and the orby pattern locks it in. 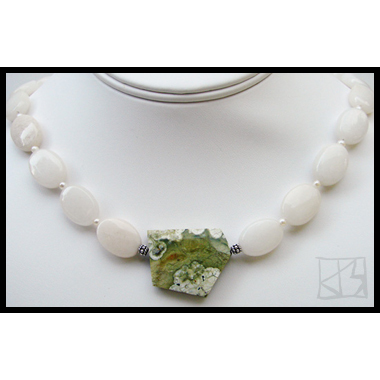 Centered among milky white jade ovals separated by genuine freshwater pearls and finished with a sterling silver j-clasp. Elegant and contemporary with a colorful flair.